Hawryliw, Jaroslaw [Ярослав Гаврилів] – mining engineer, active in community affairs; born on 30 March 1889 in Krynytsia, Lemko region (Krynica-Zdrój; Nowy Sącz county, Małopolska voivodeship, Poland; at that time – Austrian crown land of Galicia); died on 8 July 1963 in St Albans, England, United Kingdom; buried in Hatfield Road Cemetery, St Albans. Hawryliw attended secondary school in Stanislav (now Ivano-Frankivsk, Ukraine; Stanislav in 1772-1918 and 1939-1962, Stanyslaviv in 1918-1939). In 1913 he gained a mining engineer’s degree from the University of Mining in Leoben, Austria. During the First World War he served in the Austrian army and attained the rank of lieutenant. In late 1918, when the Western Ukrainian People's Republic came into being, he was appointed manager of lignite mines near Kolomyia. Shortly afterwards he joined the Ukrainian Galician Army (UGA) as a lieutenant and served in a company of railway troops. After the remnants of the UGA in Right-Bank Ukraine were disarmed by the Polish army in April 1920, he was interned in a Polish camp. On 1 October 1921 he began to work at an oil field in Bytkiv, near Nadvirna (Ivano-Frankivsk oblast) but was subsequently dismissed by the Polish authorities on account of his Ukrainian nationality. In 1928 he was working in the village of Nebyliv (Ivano-Frankivsk oblast). Before the Second World War he also lived in Boryslav and Stanislaviv. From 1941 to 1944, during the German occupation of Western Ukraine, he was head of the department responsible for oil and gas extraction in south-eastern Galicia, based in Stanіslav. At this time he founded an association of Ukrainian engineers, but this was subsequently dissolved by the German authorities. After the arrival of Soviet forces in Western Ukraine in 1944 he left for Kraków, Poland, and subsequently crossed into Czechoslovakia. After the end of the Second World War, with the help of the United Nations Relief and Rehabilitation Administration, he found his way to a displaced persons camp in Landshut, Germany. For a short time he was head of the camp residents’ council. In 1948 he moved to the United Kingdom, where he became active in the Ukrainian community. He was a leading member of the Association of Ukrainians in Great Britain (AUGB): 1949-53 – member of the AUGB Governing Council, 1954-55 – head of the AUGB Finance Control Committee (financial oversight committee), 1960-63 – president of the Association. 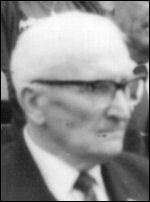 From 1960 he was head of the steering group overseeing the Shevchenko Centenary Committee in Great Britain (formed for the purpose of organising the commemoration in Great Britain of the centenary of the death of the poet Taras Shevchenko). He was also a member of the Association of Ukrainian Former Combatants in Great Britain and of the Ukrainian Officers’ Club. From October 1954 he was the UK representative of the Munich-based publishers of the Suchasna Ukraina and Ukrainska Literaturna Hazeta newspapers (to 1960) and of the Suchasnist journal (from 1961 to his death).